Happy Saturday my friends and welcome back to 3-Ingredient Happy Hour, the weekly drink column featuring super simple yet delicious libations. This week I'm making a less-nuanced version of one of my favourite in-it-for-the-long-haul beverages: the Diplomat cocktail. 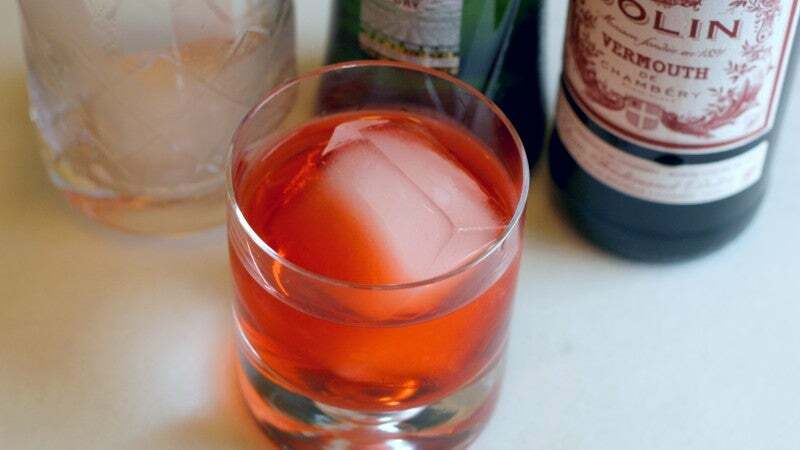 The vermouth-based drink is as practical as it is delicious; by using vermouth as the main source or ethanol, you get a cocktail with a much lower alcohol content, letting one remain diplomatic for as long as possible. I became acquainted with them while dating a dishwasher who worked late nights at a bar, in an attempt to still be "on" by the time he got off work. Besides being more on the sessionable side, they're also delicious. They're usually made with both sweet and dry vermouth as well as maraschino liqueur, but we're going to futz with that last bit. Combine everything in an ice-filled stirring glass, stir to chill and dilute, then strain into a lowball over a big rock. Though this particular Diplomat won't be as nuanced and polished as his proper friends, he's still a tasty little number. Also, this is a great use for that vermouth that's been hanging out in your fridge for a bit too long; waste is such a tragic thing.